Highly mobile eyebrows that can be used to express a wide range of subtle emotions may have played a crucial role in human survival, new research from the University of York suggests. Like the antlers on a stag, a pronounced brow ridge was a permanent signal of dominance and aggression in our early ancestors, which modern humans traded in for a smooth forehead with more visible, hairy eyebrows capable of a greater range of movement. Mobile eyebrows gave us the communication skills to establish large, social networks; in particular to express more nuanced emotions such as recognition and sympathy, allowing for greater understanding and cooperation between people. The study contributes to a long-running academic debate about why other hominins, including our immediate ancestors, had gigantic brow ridges while anatomically modern humans evolved flatter foreheads. Senior author of the paper, Paul O'Higgins, Professor of Anatomy at the University of York, said: "Looking at other animals can offer interesting clues as to what the function of a prominent brow ridge may have been. In mandrills, dominant males have brightly coloured swellings on either side of their muzzles to display their status. The growth of these lumps is triggered by hormonal factors and the bones underlying them are pitted with microscopic craters - a feature that can also be seen in the brow bones of archaic hominins." "Sexually dimorphic display and social signalling is a convincing explanation for the jutting brows of our ancestors. Their conversion to a more vertical brow in modern humans allowed for the display of friendlier emotions which helped form social bonds between individuals". 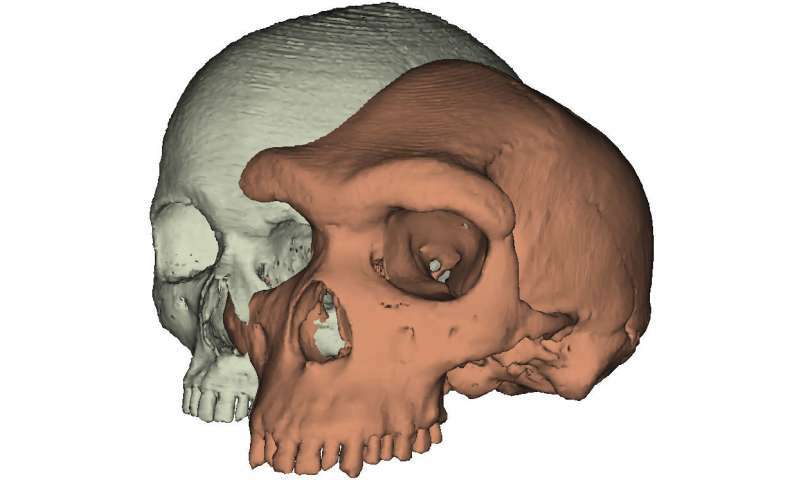 Using 3D engineering software, the researchers looked at the iconic brow ridge of a fossilised skull, known as Kabwe 1, held in the collections of the National History Museum. It belonged to a species of archaic hominin - Homo heidelbergensis, who lived between 600,000 and 200,000 years ago. The researchers discounted two theories commonly put forward to explain protruding brow ridges: that they were needed to fill the space where the flat brain cases and eye sockets of archaic hominins met, and that the ridge acted to stabilise their skulls from the force of chewing. Professor O'Higgins said: "We used modelling software to shave back Kabwe's huge brow ridge and found that the heavy brow offered no spatial advantage as it could be greatly reduced without causing a problem. Then we simulated the forces of biting on different teeth and found that very little strain was placed on the brow ridge. When we took the ridge away there was no effect on the rest of the face when biting. "Since the shape of the brow ridge is not driven by spatial and mechanical requirements alone, and other explanations for brow ridges such as keeping sweat or hair out of eyes have already been discounted, we suggest a plausible contributing explanation can be found in social communication." According to the researchers, our communicative foreheads started off as a side-effect of our faces getting gradually smaller over the past 100,000 years. This process has become particularly rapid in last 20,000 years and more recently, as we switched from being hunter gatherers to agriculturalists - a lifestyle that meant less variety in both diet and physical effort. Co-author of the paper, Dr Penny Spikins from the Department of Archaeology at the University of York, said: "Modern humans are the last surviving hominin. While our sister species the Neanderthals were dying out, we were rapidly colonising the globe and surviving in extreme environments. This had a lot to do with our ability to create large social networks - we know, for example, that prehistoric modern humans avoided inbreeding and went to stay with friends in distant locations during hard times. "Eyebrow movements allow us to express complex emotions as well as perceive the emotions of others. A rapid "eyebrow flash" is a cross-cultural sign of recognition and openness to social interaction and pulling our eyebrows up at the middle is an expression of sympathy. Tiny movements of the eyebrows are also a key component to identifying trustworthiness and deception. On the flip side it has been shown that people who have had botox which limits eyebrow movement are less able to empathise and identify with the emotions of others. "Eyebrows are the missing part of the puzzle of how modern humans managed to get on so much better with each other than other now-extinct hominins." 'Supraorbital morphology and social dynamics in human evolution' is published in Nature Ecology and Evolution. Yes, eyebrow movements are important for expressing & perceiving emotions (as Darwin already knew), but this is a secondary evolution, probably long after eyebrows & supra-orbital tori (SOT) evolved for other reasons (Med.Hypoth.35:293-300, 1987). SOT were necessary to protect the eyes in platycephalic skulls, and platycephaly probably evolved at the time when early-Pleistocene Homo evolved heavy & brittle skeletons (pachyosteosclerosis POS): when they dispersed intercontinentally along African & Eurasian coasts, google "Ape and Human Evolution 2018 made easy". POS is exclusively seen in littoral animals (J.compar.hum.Biol.62:237–247, 2011), and the inclusion of littoral foods (DHA-rich) helps explain archaic Homo's dramatic brain enlargement. When platycephalic skulls were no longer necessary (late-Pleistocene evolution from archaic to modern Homo), SOT disappeared, and eyebrows could change their function (preadaptation) for expressing & perceiving emotions.